Every song is a journey: a voyage of the human experience explored through the intersection of poetry and music. In fact, a song serves as a natural extension of the original poem that allows us to experience words in a new and insightful way. A composer of songs is then also a poet: a creator of profound meaning through text, meter, harmony, texture, and lyricism. The great English composer Benjamin Britten (1913-1976) is a prime example. A great lover of poetry throughout his life, and friend to such great poets as W. H. Auden, it is difficult to think of another song composer who consistently chose poems of such high quality and breadth to set to music. Furthermore, Britten seems to fall in line as the rightful successor to Franz Schubert in the way he virtually composes the essence of a poem musically. 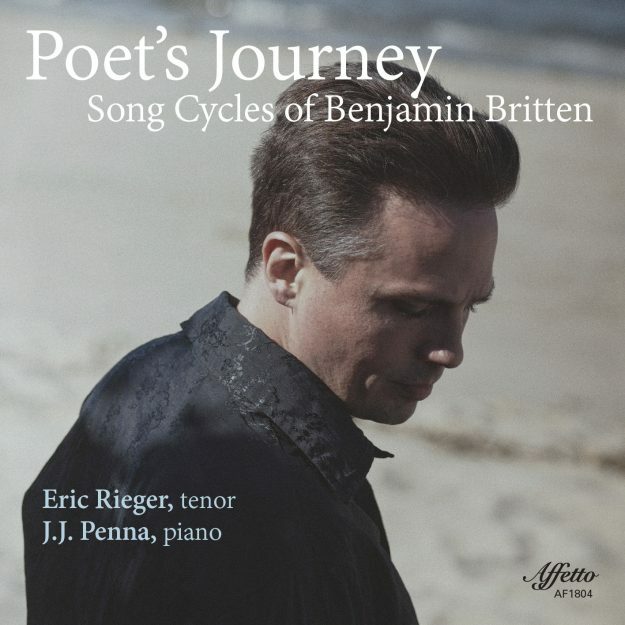 On this recording by outstanding tenor Eric Rieger and renowned accompanist JJ Penna, we explore the Poet’s Journey in three of Britten’s most important song cycles, each of which is bound to the works of a great poet: Michelangelo, Thomas Hardy, and John Donne. In each work, we discover Britten’s gift of lyricism, superb understanding of the voice, and exceptional pianistic capabilities. One finds a clear reverence to composer Henry Purcell through the use of florid, expansive setting of text and the use of ancient compositional techniques such as the ground bass. Britten skillfully combines these concepts with the modern influence of such great 20th century composers as Mahler and Stravinsky to create something unique and exciting. By nature, he was also a great collaborator who always chose to make music with other musicians over pursuing a career as a solo pianist. It is only natural that he would choose to compose so many songs extending most into song cycles to adequately express his deepest thoughts and feelings through an intimate and collaborative approach. This album is, without doubt, one of the finest collections of Benjamin Britten’s style, his work, and his gift to the world of music.